Inspired by Chris Brogan in 2015, with each new year I choose three words to guide the thoughts and actions for the year. This process has been significantly more useful than making a New Year’s Resolution. Of course, anything is more useful than a New Year’s Resolution since most are abandoned before Valentine’s Day — lying in a dull heap of once sparkling plans. Consistent – Have you ever been doing something consistently (managing your tasks, eating more healthfully, etc.) and getting great results and suddenly realize you’ve stopped doing it? And the new results you’re getting show it? Yeah, me too. The reason you and I do this is twofold. First, take eating healthy food. Doing so means you probably drop a few pounds and feel better overall. Consequently, you feel entitled to something decadent. What could it hurt? One extra piece of pie isn’t going to undo all the good choices you made, right? But that one thing, if not managed, can quickly and quietly drag you out of your consistent program. The second reason is that novelty is more interesting and fun than being consistent. The bright shiny new way of tracking your workload may be even better/simpler/faster than the way you’re successfully doing it now, you think. Even researching new ways to do things is usually more fun than actually doing those things. So. System abandoned for the latest thing that you don’t fully implement and now you feel buried. Often you don’t even remember the great system that had you on top of your work until you feel the current frustration of being overwhelmed and wonder what happened. Why did I stop doing that when it was working pretty well? In almost every instance, being consistent reaps benefits. Follow consistent processes in business, (business development, content creation, client onboarding, to name just a few) and success follows. Consistently exercise, meditate, get enough sleep and eat well and you’ll be at your best. Every day I’ll ask, “Am I being consistent?” and adjust accordingly. What plan that’s working am I in danger of abandoning? I have a suspicion this practice will grow in value and importance as the months go on. Kintsugi – This is a new-to-me term that aligns beautifully with my belief about we humans. 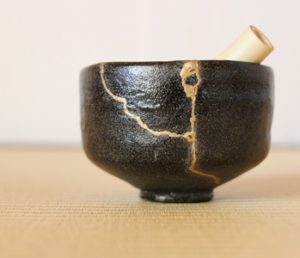 Kintsugi is the art of repairing broken pottery with lacquer mixed with powdered gold, silver or platinum. The idea is that the history of the item is the treasure and rather than disguise imperfections, they should be appreciated and valued. In practice, that’s embracing the imperfect in ourselves. It could be said that my clients want to change something that is “broken” with regard to how they spend their time or manage their people skills. They want to get better results. The gold is in putting themselves out there to repair what’s not serving them. They are better and smarter and more successful because they don’t feign perfection. More than just not being so hard on ourselves. It’s being proud of the scars. I’m about to have surgery on a fractured elbow and there’ll likely be a scar. A scar just says I was out there running instead of sleeping in. Every day, where is the imperfection I can celebrate? In me or the people I care about? In the house or yard? In my skills as a business-owner, parent or volunteer? Mindful – This word has been on my mind for so many years it was a little surprising that I’d never chosen it before. I’ve tiptoed around a mindfulness practice and know the benefits of doing so. But along with word #1, my efforts are now consistent. Just a little bit everyday until it becomes more and more routine. It’s a practice that doesn’t require any tools or books. Just remember to pay real attention now and again. There are hundreds of opportunities every day to be in the moment. I’ll never know of the impact this could have unless I go all in. So, all in I go. These words are visible as a screen saver, picture on the office wall, printed on daily planning sheets, etc., to keep them top of mind. As I often say, it’s not that we refuse to practice new behaviors, we simply forget to practice them. The physical reminders counteract the forgetfulness that creeps in when we’re not – well – being mindful. If you choose your own three words (You don’t have to do it at the beginning of the year. Anytime is a good time for a fresh start.) share them with me. I’d love to know what you come up with.